The Greek progressive metal scene isn’t renowned as the biggest in the world, but if Until Rain are representative of what it has to offer A&R people should do some serious scouting around that part of the world. 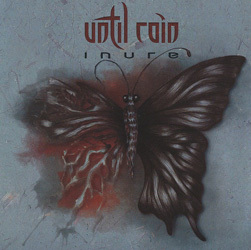 With two albums and an EP to their name – and a history originally stretching back to 2004 – Until Rain can no longer be seen as the new kids on the block; but their latest offering ‘Inure’ is certainly their best to date, and displays an innate confidence and maturity which allows the band to push and pull at the boundaries of the genre. Overall, it’s a dark offering, brooding and menacing, although when the need arises lush soundscapes lift the songs from shadows, injecting hope and sanguinity into an otherwise desperate creation. The nine cuts on offer serve up endless surprises as they twist and turn, with opulent vocals giving way to the extreme, and quiet passages subsumed by riffs of merciless urgency. Like chameleons, the songs change their hue at the drop of a beat, beguiling yet never predictable, driven by musicianship of the highest order and the soaring vocals of new frontman Cons Marg. Given the quality of the album, highlights – and time changes – come thick and fast, although the title track is beauty personified and the six-and-three-quarter minute ‘This Solitude’ is a masterclass in light and shade. ‘Inure’ is an album of rare splendour, and a progressive metal fan’s dream. What’s not to like?